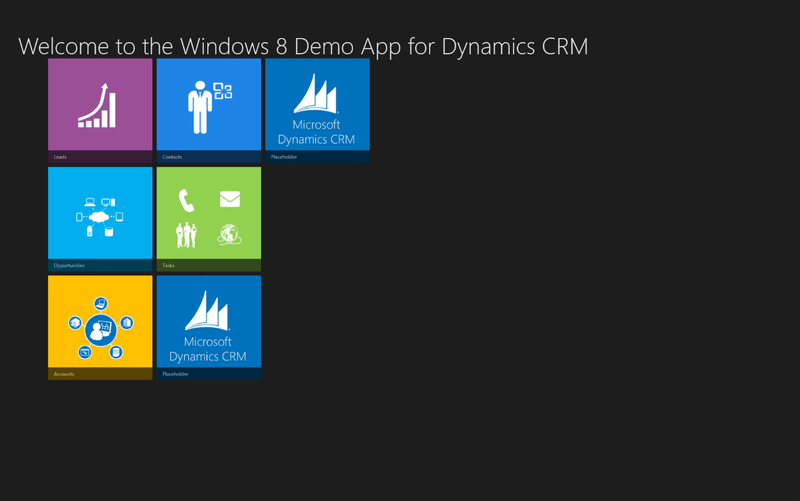 Windows 8 has opened up a new world of exciting possibilities for Microsoft Dynamics CRM and App development. Many of you have seen the preview demonstrations of the touch-enabled CRM sales app that is coming, and this is just one example of the powerful capabilities provided by the combination of Windows 8 and Dynamics CRM. We did a Windows RT Example Blog post last fall that provided a library for authenticating and sending SDK requests to the Dynamics CRM service. This post takes that article a step further, automating the login process to demonstrate a Windows 8 App connecting to Microsoft Dynamics CRM Online and displaying CRM information in the app. The example provided below highlights the basics and is intended to give readers the information they need to modify and build on the code so that they can use the new features of Windows 8 to develop some great CRM apps. Note: Modifying the app further requires previous Windows 8 C# programming experience, but an exploration of Windows 8 App development is beyond the scope of this article, but some great resources such as downloadable tools, free eBooks, and hands-on-labs are available on the Windows 8 MSDN Site. Also note that the sample presented here works only with Dynamics CRM Online using O365 authentication credentials; modifying the authentication is also beyond the scope of this article. The associated downloadable project (link at the end of this article) includes all the code that is illustrated in this article, but the detailed steps are laid out for you here. I’d like to thank Jono Lind for his help with the automated authentication pieces! Clicking on any of the tiles, such as the Accounts tile, can load another page that shows the CRM data for that record type, but in the example App, only the Accounts and Tasks tiles are enabled (Exercise: modify the App to make other tiles work!). There are tiles for Leads, Opportunities, Accounts, Contacts, and Tasks, and also provided is a “Placeholder” image that can be remove from the app or modified to display other CRM information. After making this change, you should be able to run the app and connect. Now let’s take a look at adding the functionality to the app to display the Accounts in your CRM system. The tasks view uses a List box, so we’ll use the same format for the Accounts. 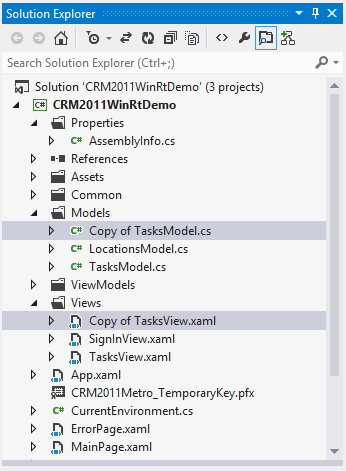 In Visual Studio there are two files involved with displaying the Tasks: the “TaskModel.cs” file in the “Models” folder, and the “TasksView.Xaml” file called in the “Views” folder. Double-click “AccountsModel.cs” to open the file, find every instance of the word “Task” and replace it with Account (except in the “using System.Threading.Tasks;” line!). 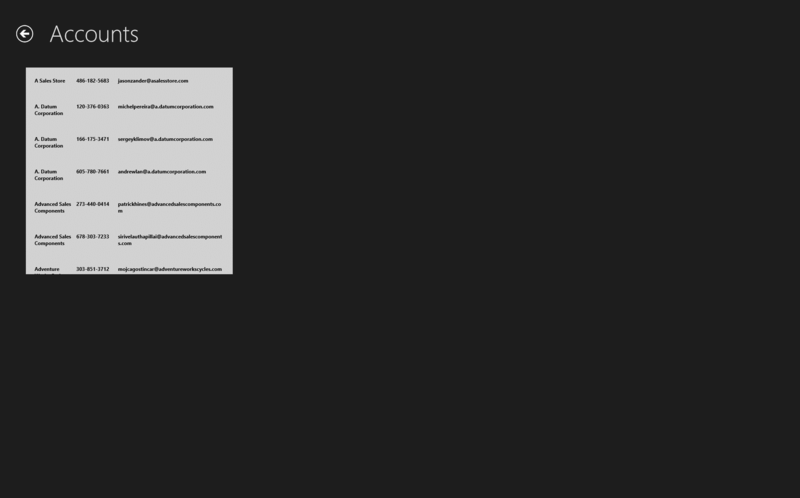 Later on we’ll have to fix the queries and display code, but for now just do the find and replace. 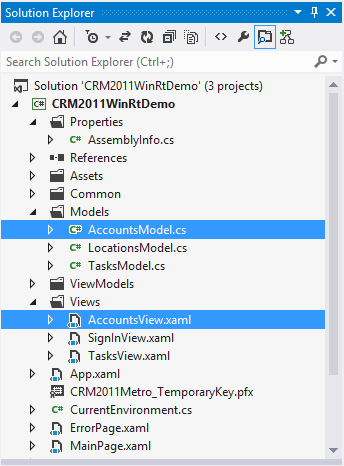 Repeat the process for the files “AccountsView.Xaml” and “AccountsView.Xaml.cs” in the “Views” folder. At this point if you’ve replaced all the words “Task” correctly in the files, you should be able to build the project successfully, although we cannot run it yet as we need to fix the queries and other code. Next, we need to make similar changes to the “AccountsView.xaml.cs” file in the “Views” folder. At this point, you should be able to build with no errors so press F6 to test the build. Now that you have the basics in place, you can modify the Windows 8 Project in whatever way you want! For example, an immediate enhancement that I’ll be working on is to enable Contacts functionality, and I am going to use an Items view to display the Contacts, and perhaps integrate Skype and/or Lync. The sky is the limit for Windows 8 and CRM apps! 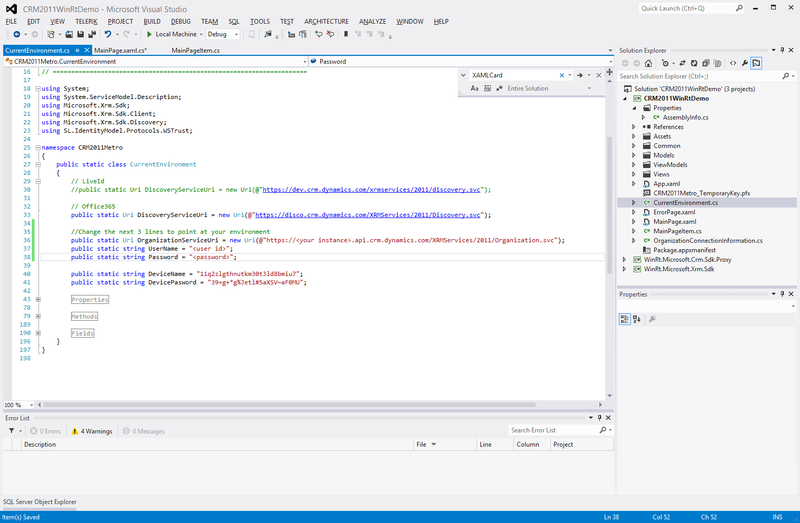 Download the full Visual Studio project code from CRM2011WinRtDemo Source.